Hellenic Holidays EXCEEDED my expectations. As a bride overwhelmed with her wedding, Petros stepped in and planned the most magical honeymoon/vacation my husband and I have ever been on. He really listened as to what we wanted to see and gave us great recommendations. From the moment we landed we had no worries because Petros explained the itinerary and even checked in on us periodically. We told Petros we wanted to relax, eat great food, and also have some adventure. He captured all of this in our trip. I have not ONE complaint. I came back to work and everyone’s first comment was like, wow you look tan and relaxed. Mission accomplished. I definitely recommend Petros and Hellenic Holidays for any of your Greek travel excursions!! Hellenic Holidays provided impeccable service. We had never used a travel agent before and were somewhat apprehensive about ceding control of our honeymoon to someone else, but we are so glad that we did. Petros and Hellenic Holidays planned and executed a honeymoon beyond anything we could have put together ourselves. After the trip had been planned, we unexpectedly needed to delay our honeymoon by a whole year, and Petros was incredibly gracious and accommodating in making this change. I would highly recommend Hellenic Holidays to anyone thinking about a honeymoon in Greece. Petros was amazing from the minute we spoke on the phone. He is great at knowing what people want, and he helped my husband and I plan our dream honeymoon. He had everything taken care of which made our honeymoon in Greece effortless. He even communicated with us while we were in Greece to see if we needed anything and to ensure we were having the best time. Hellenic Holidays is the only way to travel the right way for your honeymoon. Five stars is not enough stars to rate the quality and attention provided by Petros and Hellenic Holidays! Petros organized everything for us down to the tiniest detail while somehow giving us the freedom to find our adventures at the same time. I could not be happier with or more thankful for the honeymoon that Petros arranged for me and my wife. Petros and Hellenic Holidays were a perfect choice for our Honeymoon. We booked late for the busy season, but he was able to make it work for our schedule and budget. 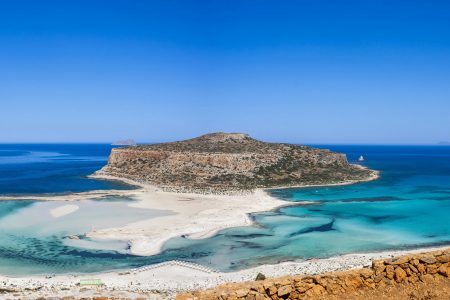 We chose the Athens/Naxos/Santorini package and it was incredible. VIP treatment all the way. Whenever we had activities scheduled, we had private transportation to our destination and back to the hotel. This was the first time I had traveled internationally and Petros could hear the anxiousness in my voice – he made me feel at ease by explaining the details. True to his word, he thought of every detail and made himself available if we had any issues. He checked in on us from time to time to make sure everything was running smoothly. For the days we had leisure time, he had great suggestions for things to do and his recommendations for restaurants were top notch. We plan to go back to Greece in the future and will definitely use Hellenic Holidays again. Hellenic Holidays is the best! Petros took care of every little detail on this trip, we told him exactly where we wanted to go in Greece and he sure did an excellent job. We chose Athens, Mykonos and Santorini, what an amazing time we had. A week before our honeymoon, we had a conference call with him and explained our itinerary and was very specific on what we needed to bring with us. He also provided us with a very detail booklet with names and addresses of restaurants, bars, lounges and what we must see in each place, we follow every instruction he gave us and everything was excellent! In Santorini, he arranged a semi-private sailing tour, it was amazing! The captain and the crew were awesome, they provided us food, wine, soda, water, and everything was unbelievable. We watched the most beautiful sunset from the yacht with champagne and fresh fruits. Our Hotel in Santorini was located on the highest point of the Island and we had the most breathtaking view, every morning they will bring our breakfast to our balcony to enjoy the view. Overall, Petros did an outstanding job and we had and amazing time in Greece. Thank you Petros you Rock!!!!!!! Petros and Hellenic Holidays sure gets a lot of 5* reviews, doesn’t he? Well I figured it might be nice for someone to be a bit more honest on here and tell you some of the shortcomings of Petros and his company. So here goes nothing. … … Shoot, I couldn’t come up with a single thing. Seriously, though, Petros is fantastic. My wife and I are the type of people who are willing to pay a little extra for peace of mind and to avoid the time-sink that comes with planning something we aren’t super familiar with. Petros was worth every penny (and while I can’t prove it, I came away feeling like his services were free since I’m pretty sure he got us deals we otherwise would not have gotten and made the whole trip cost a bit less anyway). His detailed itinerary gives you the perfect road map of how to spend your vacation even if, as we did, you go for two whole weeks. Here’s the best part, though: he builds in plenty of free time and/or optional activities that you never feel over-stressed. Also, every food recommendation he gave was spot on so while in Greece, avoid the tourist trap restaurants that are prevalent and stick with his suggestions. You won’t be sorry. There is one more thing I’d like to say (there’s plenty more I COULD say, but other reviews have covered those things ad nauseum), and it’s probably the most important. There is an intangible in Petros that is hard to describe that just blew my wife and I away. It has to do with instinct, I think. If I look back on our trip, for 13 days, he got every order 100% correct. Every time we woke up feeling like we’d been busy for a couple days and I was really tired, I’d look at my itinerary and there was a built in rest day. Every time we woke up energetic and feeling like an adventure, our itinerary provided just that. Folks, that’s something you can’t teach. Petros cares deeply about his service, has mastered every detail of that service, and I cannot possibly recommend somebody with higher praise than I can him. 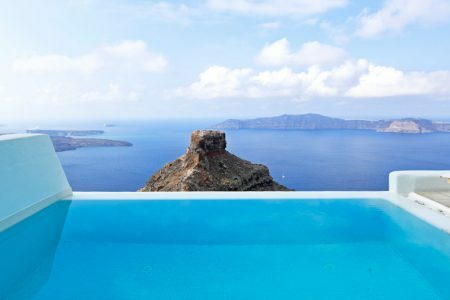 If Greece is where you want to go for your honeymoon, you simply have to let Petros plan it. Thanks Petros! I would like to nominate Petros Zissimos at Hellenic Holidays as a top travel specialist for Greece. Mr. Zissimos exceeded my expectations arranging our recent trip to Greece. And, while I am a tough sell, it is more difficult to exceed my husband’s expectations. Petros was on target to do that from the beginning of our travel to the end of tour of Greece. My husband and I enjoy traveling as our hobby so I was somewhat surprised by his resistance to go to Greece. In looking back on what made our trip a grand success, Petros’ expert knowledge in customizing experiences for his clients is a direct result from the fifty eight times he himself has gone to Greece. We were impressed with how important it was to him that we enjoyed the experience while he took care of all of the details before, during and after the trip. Petros knows that a positive trip comes from effective upfront planning. He guided me at a pace at which I was comfortable as he presented the myriad of options available. He was interested in what we wanted and was confident that he could provide it. Weeks before we left, every detail was in place including where we would eat each day. I have several dietary restrictions that he respected and when we were in Greece, it was clear that Petros had made sure the restaurants met them. Petros has developed strong relationships with hotels, restaurants and tourist providers. We could see that they too wanted to provide the best service possible in order to meet Petros’ expectations. That is a winning combination. We are very comfortable recommending Petros Zissimos as a top travel specialist for Greece with Travel and Leisure because he served that role for my husband and me and we are certain that he does that for all of his clients. I would like to nominate Petros Zissimos and Hellenic Holidays, Inc. as a top travel specialist for Greece for Conde Nast Traveler. I was referred to Petros Zissimos by a colleague and from the first time I called him to discuss our travel objectives — it was his goal to understand what we wanted to do, what type of trip we were looking for. He was responsive to all our questions and amendable to working through various iterations of an itinerary to meet our needs and requests, but also providing us guidance along the way. 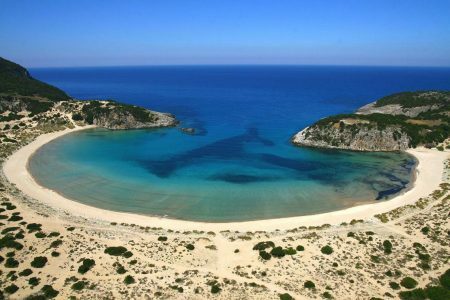 He came up with a fantastic itinerary that sent us to Mykonos, Naxos, Santorini and Athens. He provided great advice on which islands to visit, how long, where to stay as well as some terrific activities included in the package — a semi-private sunset cruise and walking tour of Athens — and arranged all ground, ferry and airport transfers. It was all top notch and well-orchestrated. Upon our departure from the US, we had an airline mechanical issue on the night of our departure, which impacted our other connecting flights. One call to Petros to let him know of our delay, and he was on it and got up at 2 am to call his airline contact in Greece to ensure our transfer flight was modified as we flew across the Atlantic. It truly set our minds at ease to know we were in good hands. It was a truly stress free vacation. We met a few other Hellenic Holidays clients in Santorini on our semi-private sunset sail, which was one of the highlights of our trip that Petros arranged. My husband states, “This was one of the best vacations I’ve ever had” and I couldn’t agree more. I’ve already told a number of colleagues and friends that they must travel to Greece and use Hellenic Holidays. Our family, of four adults, just returned from the trip of a lifetime arranged by expert travel advisor Petros Zissimos of Hellenic Holidays. We were traveling to a family wedding in Bari, Italy from the states and decided to visit the “seat of civilization” and the home of our ancestors first. Mr. Zissimos responded immediately to our request and customized a trip that would allow us to fully experience Greece within our time limits. He was always available for consultation and advisement over the months of planning and offered valuable information for our connections to Italy. The excellent accommodations, flawless connections and all of his detailed recommendations were perfect. We experienced first class service, drivers, guides and just a lot of fun. Petros anticipated the interests and needs of our adult children in Athens, Mykonos and Santorini which was greatly appreciated. It was a wonderful trip and a memorable family experience we will have forever. Please consider this message our nomination of Petros Zissimos as a top travel specialist for Greece. We would like to nominate Petros Zissimos at Hellenic Holidays for the top travel specialist award at Travel & Leisure. Even after speaking to tons of travel agents at the New York Times Travel Show, my boyfriend and I knew we wanted to book our next vacation through Petros. We’ve traveled all throughout Europe, but this trip to Athens, Mykonos, and Santorini has been our favorite thus far. The trip Petros planned for us was intoxicating, beautiful, cultural, and flawless. Petros’s communication skills and attention to detail are unbeatable. He always responded to our emails in a timely manner and answered all questions we had with honesty. We were not expecting to receive such a detailed, planned out itinerary. Not only did Petros book domestic transportation and hotels for us, he listed out restaurant recommendations, places we might want to see, and activities he thought would interest us. As foodie’s we were a bit hesitant to stick to the restaurants that Petros recommended, but every single one was top notch and ridiculously delicious. The food in Greece is amazing! Our trip to Greece was one of a kind, and most importantly, it was affordable! We never felt like Petros was trying to gyp us and he was more than helpful in planning a trip that was within our budget. When we asked Petros to remove one day from the itinerary he originally planned so that we could stick to our budget, he did not hesitate to do so. It was comforting to know he always wanted to ensure we had the best experience possible. Petros definitely deserves your top travel specialist award and we hope to hear that you agree!